(1) This mug is black. Sorry, other colors are sold out. 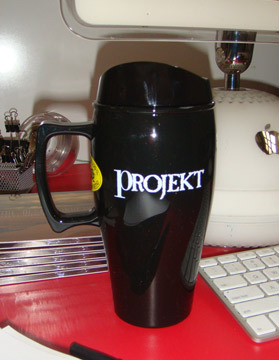 (2) The Projekt Logo is printed in white on both sides, good for Left and Right-handers. (3) Because of weight, this item cannot ship First Class Mail. It will be shipped Priority Mail and charged accordingly. (4) While this item can be used in the microwave, it is not recommended for use in dishwasher.